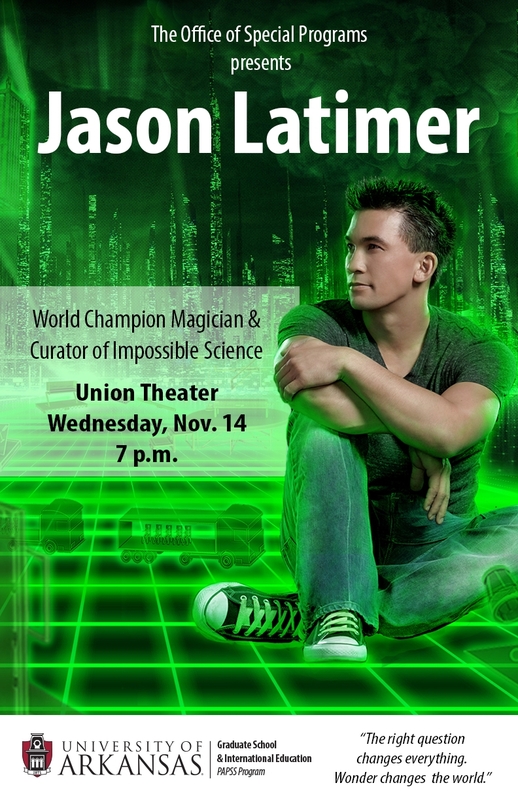 Jason Latimer's magic will inspire wonder during his Nov. 14 performance. Prepare to be amazed by the illusions of Jason Latimer. The world champion magician and curator of impossible science will bring his tricks to campus next week. Latimer will perform at 7 p.m. on Wednesday, Nov. 14 in the Arkansas Union Theater. The performance is free and open to the campus community. Latimer is the series champion of BBC One's The Magicians and is a winner of Siegfried and Roy's Masters of the Impossible Award. He also earned magic's highest honor "Grand Prix 'Best Overall' World Champion of Magic." He is one of the few recipients of the Masters of Magic Golden Grolla award. Latimer is also a scientist. He created "Impossible Science," an academic platform using magic and science to inspire wonder in education. Recently, Engineering.com and Latimer launched the Impossible Science Student Challenge. The program engages K-12 students to challenge the impossible through their how's, why's, what if's and why not's. The program encourages students to think outside the box using science, technology, engineering and mathematics. The Office of Special Programs is sponsoring Latimer's performance.